Vert-X 1600 Series sensors measure 0 to 360° with full resolution and accuracy at programmed electrical angles as well. 05/01/14, 11:50 AM | Factory Automation | ABB Inc. Under the pressure of big box and convenience stores working to increase supply chain efficiency, many manufacturers are faced with packing their products into increasingly smaller cases. Pearson Packaging Systems can accommodate these ultra-small boxes with increased precision to maintain high output levels. VadaTech now offers a MicroTCA Carrier Hub (MCH) with a 40GbE option, synchronous Ethernet, and advanced clocking/GPS capability. The xiQ series - the world's smallest and fastest USB3 cameras - have been proven in latest plugfest tests to fully comply with the USB3 Vision Standard. Microscan announces a series of live New Technology Workshops to introduce the latest easy-to-use machine vision and barcode reading solutions. This global training program kicks off on May 1, 2014 at the Microscan Northeast Technology Center in Nashua, NH. New ­­­­100+ Megapixel (MP) video camera system will be demonstrated at SPIE Defense and Security (DSS) in Forza Silicon's booth # 939, Baltimore Convention Center, Baltimore, MD, May 6 - 8, 2014. Festo is showcasing new technology such as an all-in-one DC servo motor/drive for fast precise motion control and a host of training options offered by Didactic, the company's training arm. 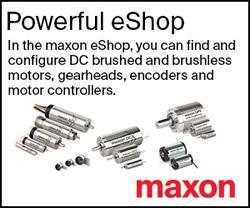 The next generation of high-performance positioning controllers maxon motor launches the MAXPOS 50/5. This compact EtherCAT Slave unveils unprecedented possibilities as far as precision, dynamics, and synchronization are concerned.